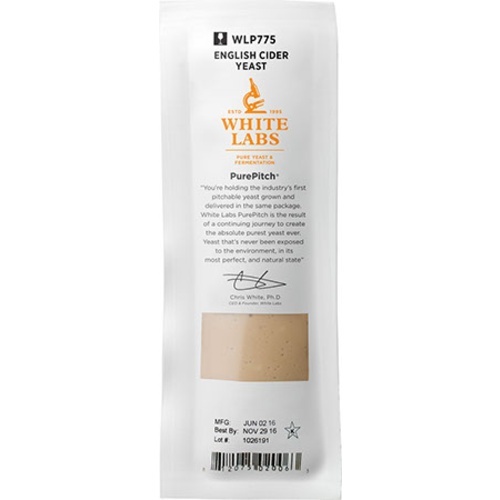 WLP775 is a classic cider yeast. This particular cider yeast will ferment dry, but retains flavor from apples. Sulfur will be produced during fermentation, but will disappear in first two weeks of aging. This cider yeast can also be used for wine and high gravity beers. We've been using this commercially for over a year. It beat 11 other yeasts in our taste tests. It's one of the few yeasts that keeps a nice apple flavor in the finished product. The stats say 70-75 degrees but I think that's for fastest ferment. We ferment at 62 and get an even better flavor. I've pitched this into 38 degree cider and it still came alive and worked as the temp rose to room temp. It can sometimes give a sulfur smell during early fermentation, but I've never had it carry over into the final product. Go 775! Check the White Labs website for a nice homebrew club recipe from Maine using a bourbon barrel and brown sugar and 775. I use this in my house cider and it gives and excellent crisp taste.